A deliciously refreshing condiment with the familiar flavor of Soy Sauce, and citrus undertones, Chef Devaux’s unique Steak Tataki sauce is the perfect partner to this sumptuous sirloin steak appetizer. 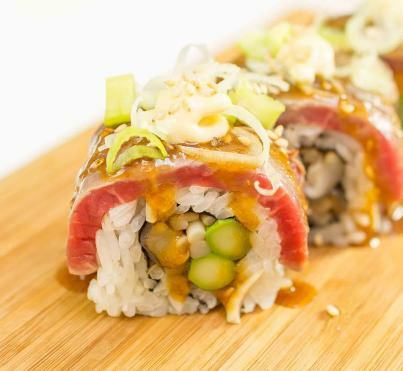 Though it calls for a variety of ingredients and some preparation, this Steak Tataki Sushi Roll recipe is well worth the effort; a delicious marriage of flavors, enhanced by peppery spring onions, Truffle-oil infused Kewpie mayonnaise, and earthy, toasted sesame seeds. Pour 100 ml of Soy sauce into a tall measuring jug, followed by the rice vinegar. With a spoon, add 15 grams of finely grated ginger to the liquid. Trim off both ends of the garlic clove, then peel off the outer skin. Crush over the jug using a manual garlic crusher. Use a spoon to scrape off any excess from the crusher into the mixture. Next, empty a 2 gram sachet of Xanthan Gum into the jug, followed by the juice of half a squeezed lemon. Take care to avoid any pips or flesh falling into the liquid. With the hand blender, whisk the contents of the jug thoroughly for 30-60 seconds, or until a slight froth is observed. Do not over blend, or the sauce will become to gooey to drizzle over the sushi roll. Add a tablespoon of sesame seeds to the mixture, followed by a drizzle of sesame seed oil. Mix well, then pour the contents of the jug into a squeezable plastic bottle and refrigerate. For the sushi roll sauce topping, simply add approximately 3-4 tablespoons of Kewpie mayonnaise, and a drizzle of truffle oil to a glass bowl. Combine well using a teaspoon, then spoon into a squeezable jug and refrigerate. Preparing the Sushi Roll Ingredients. Lay the sirloin steak flat on your chopping board. Using your fingers as a guide, trim off a little from each end until the steak measures approximately four finger widths in total. You will then need to cut horizontally through the steak to reduce its overall thickness. Cut thin, horizontal layers from the top until the steak is roughly two finger widths in thickness. Add 1-2 teaspoons of sesame seed oil to your frying pan and heat on a low to medium setting. In the meantime, begin seasoning the sirloin with smoked sea salt. Sprinkle lightly over the top surface; flip the entire steak over, and repeat on the underside. Using a pair of metal tongs, add the filet to the pan. Sear on all sides for a few seconds – bar the two ends. These will be trimmed off later. Set aside on your chopping board to rest while preparing the vegetables. Drizzle a little sesame seed oil into your second frying pan, and heat on a medium heat. Trim off any excess from the ends of the asparagus, and add to the pan. Sauté until tender and slightly golden. Halfway through cooking, add the Shimeji mushrooms to the other side of the pan. Sprinkle both the asparagus and mushrooms with a little smoked sea salt. Cook for 3-4 minutes, regularly moving with your tongs, until slightly soft. Avoid overcooking; Shimeji mushrooms can be incredibly absorbent, and will transfer excess oil to your sushi roll. Once cooked, place into small glass or wooden bowls to cool. Wooden bowls are recommendable, as they will aid in the extraction of any excess oil. Lay half a sheet of Nori flat on the chopping board, rough-side up. With your fingers, transfer 120 grams of cooked white sushi rice to the Nori sheet. Gently fluff out the rice to the edges of the sheet, until an even coating is achieved. Encase the bamboo rolling mat in a zip-lock sandwich bag. This will ensure the rice does not adhere to the rolling mat. Then, lift the Nori sheet with your fingers, flip it over, and lay rice-side down onto the rolling mat. Position the Nori sheet lengthways in front of you. Lay two asparagus stems horizontally across the center, with the tips slightly overhanging at either end. With clean metal tongs, add a thin layer of Shimeji mushrooms just above the asparagus – again spanning the entire length of the Nori sheet. To create the roll, simply curl up the rolling mat edge in front of you with your fingers, Manipulate it up and over, using your fingers to apply pressure along the length. Curl the bamboo mat all the way over until you reach the farthest edge of the Nori sheet. With your thumbs behind and fingers in front of the roll, apply firm pressure to seal it, and compress the contents. Move to one side. Prepare the sirloin using a sharp Chef’s knife. Starting at one end, position the heel of the knife at the top edge and allow to glide through the flesh. Each slice should be approximately 5 mm in thickness. Continue slicing until you reach the end of the steak. If the piece is too flimsy to cut, lay it flat on the board, and slice through it horizontally. Set the slices to one side of your chopping board. Return the sushi roll to the center of your chopping board, and with your fingers, begin adding the slices of sirloin. Position each so that it lies across the width of the roll, taking care to ensure they do not overlap when placed side-by-side. Cut a rectangle of cling film approximately four times the width of the sushi roll. Lay it over the top of the roll, using your fingers to help it adhere to the sides. Manipulate the rolling mat around the form of the sushi roll, compressing with your fingers to ‘firm up’ the contents. Moisten a clean knife with a little water, allowing the droplets to run down the blade. This will prevent the knife from sticking as you make your cuts. 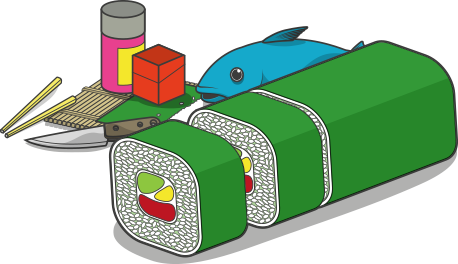 Trim off both ends of the sushi roll, then halve it by making a cut as close to the center as possible. Cut each half into thirds to yield six pieces of sushi. Remove the cling film, and discard both end pieces. Position 4-6 pieces of sushi at a 45-degree angle on the chopping board. Trim off the edges of the Wasabi stem using a knife, then grate a small quantity using the sharkskin paddle board. Position a small, loose ball of pickled ginger at the front, far end of your presentation board, followed by a small ball of grated Wasabi. Drizzle the sauce prepared earlier in a zig-zagging motion over the sushi roll slices. Then, with the blow-torch, lightly brûlée the top of each. Be sure to use a gas that does not give off fumes, as this might alter the flavor of the sauce. For best results, hold the torch approximately 2-3 inches from the surface. Decorate the surface of each slice with a pinch of chopped spring onions, followed by a dollop of pre-prepared Kewpie/ truffle oil mayonnaise. This is best applied using a squeezable bottle with a nozzle. Sprinkle a pinch of sesame seeds over each slice to finish.